Two days later, after I left, Jim went back in the evening and built a campfire in a likely clearing, and prepared to spend the night. Across the flames, he became sleepily aware that Monica was watching him. She sat crosslegged. He had a camera there, but his hand would not pick it up.. He just looked in her big brown eyes and enjoyed the experience. She sat there a long time. Then she smoothly rose from her legs, not using her arms at all, and faded back into the woods. The same Jim got treed by a very nasty black bear a few days later in the same area. He had forgot to bring the bear spray that I gave him. So he climbed as fast as he could. The bear was roaring and growling and climbing after him, but it was a large fat bear and the branches were thick. Finally the bear heard something, went on alert, shinnied back down the tree, and ran off eastward into the woods. A few minutes later from that direction Jim heard loud roaring, then whining and whimpering, then silence. Then he heard laughter. He felt that it was Monica laughing. Jim wanted to go there and see, but that bear had scared him so bad, and he felt so shaken, that he just went home. Here in the jungle, I sure do miss trout fishin. 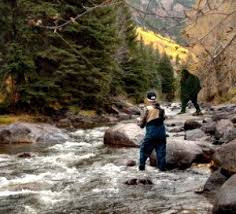 Even more I miss the springer fishing on Three Rivers up from Hebo which opens May 25. I would always have 6 or 8 hatchery springers to smoke by Memorial Day. I would always look for tracks in the grass and evidence of sasquatch coming at night to poach a few springers in the Deadline Hole, but never saw any evidence. Alas."